This dress is the perfect combination of classic and chic with beautiful detailing. The Tiered Strapless Chiffon Designer Dress by Minuet is fully lined and crafted of chiffon fabric. 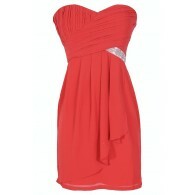 Pleated chiffon at the bust overlaps and crosses over, forming a flattering silhouette. The sweetheart neckline and lined and lightly padded bust help create a shape you’ll love. The banded waist gives way to the skirt that features tiered layers of chiffon and a draped detail off to one side. An invisible back zipper completes this dress. The Tiered Strapless Chiffon Designer Dress would be perfect paired with pumps or strappy heels and a clutch. Also available in Hunter Green and Champagne. Details: Fully lined. Invisible back zipper. Lined and lightly padded bust for support. 100% polyester. Lining: 95% polyester, 5% spandex. Dry clean only. Small measurements: Length from top of bust to hemline: 28”. Bust: 32-34”. 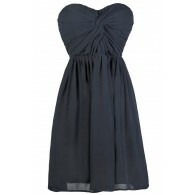 You have added Tiered Strapless Chiffon Designer Dress by Minuet in Navy into Wishlist. You have added Tiered Strapless Chiffon Designer Dress by Minuet in Navy for Stock Notification. You have set Tiered Strapless Chiffon Designer Dress by Minuet in Navy as a loved product. 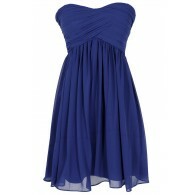 You have removed Tiered Strapless Chiffon Designer Dress by Minuet in Navy as a loved product.